CSP-501 pH Calibrator. pH precision simulator. The CSP-501 pH Calibrator simulator. 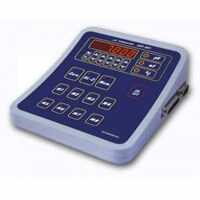 pH calibrator is used for checking accuracy of the pH-meters and finding false indications. In case of errors enables checking weather the problem is connected with the meter or the electrode. impedance of the pH-meter is sufficient for cooperating with every electrode. it is also possible to use converters to other types of connectors. CSP-501 pH Calibrator. High accuracy simulator pH, mV.